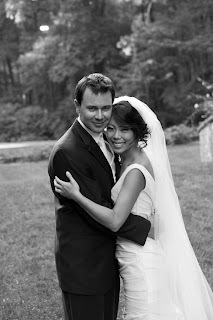 A month or so ago, I did the wedding makeup for a client of mine named Grace. I was in charge of her, as well as two mothers, a grandmother, a flower girl and five bridesmaids. Fortunately I had an assistant! We did the makeup at the hair salon that the bridal party was getting their hair done at. 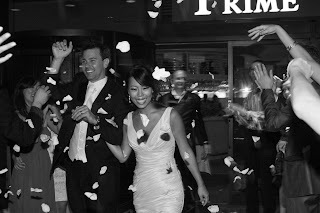 For weddings, you have to be prepared to work quickly and anticipate everything. The bridal party ended up arriving later than scheduled and when they arrived, they still needed to eat breakfast. Let's just say that it was a whirlwind after that. Situations like this are really good though because you learn to do makeup really quick. For Grace, she wanted something with a little more color. It was going to be an evening, fall wedding, so I ended up using the Spiced Chocolate quad for her eyes. On her lips we used Half Red lip pencil along with Viva Glam V lipstick. The one thing that Grace really wanted, was a thicker line of liner along the bottom. We compromised and chose a brown color that would be suitable for the afternoon into evening transition of the wedding. 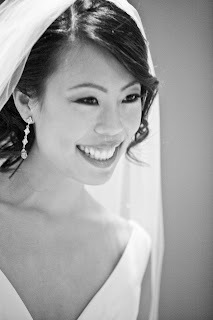 The bride and bridesmaids all had eyelash extensions put in that morning so it made my job one step easier. For the bridesmiads and mothers, we went really natural...focusing on clear, glowing skin and neutrals on the eyes with pink on the lips and cheeks. I did a little bit of extra contouring so that her face wouldn't get washed out in black and white photography. Bride and bridesmaids...I love the color of the bridesmaids' dresses! Maid of honor, aka sister of the bride. MAC blot powder in medium! Combined with primer and oil control lotion, we kept the oilies away all day! gorgeous! blot powder is the truth right? i went thru so much looking for solutions and mac blot powder had been under my nose the whole time! amazing! yeah i use the blot powder its nice keeps my face fresh. specially cause i have wicked oily skin does a gooooood job~! hehe. RenRen you did such an awesome job. Everyone looks fabulous!! I so need to learn some of your treats. Can you explain in detail how you contour? or direct me to a post or youtube vid. Thanks so much! You did a great job. She makes a beautiful bride, in fact everyone looks great! 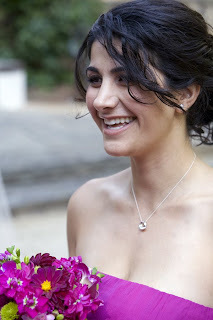 Thats exactly how you want to look on your wedding day...clean, fresh not over done...just lovely. Beautiful work, Ren! They look gorgeous! The bride and bridesmaids are beautiful! great job! For someone who likes doing bold looks, the bridal makeup looks fabulous! beautiful look! not many people pay extra attention for the makeup when it comes to black and white photos. excellent. Her makeup looks soo pretty! Natural looking, and the contour is so pretty. She looks amazing! Great job, Ren! Hi ren-you did a fantastic job, very well done indeed! Wow you did a wonderful job, they all look stunning!! 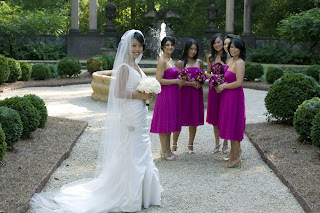 I was stunned when I saw how gorgeous Grace and her bridesmaid looked! I think u did an amazing job with her wedding makeup and I'm thinking...maybe I should get married in atlanta so you could do my makeup! you did a wonderful job :) Grace looks so gorgeous in those photos! Wow, these photos are just beautiful! 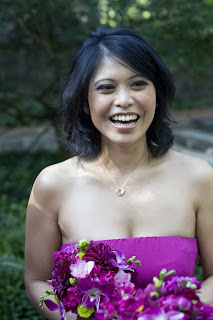 I love ur photo documentation of the wedding! And the makeup is so nice... it really goes with the hair too. Oh man, i totally wish that i knew about your blog before i got married. 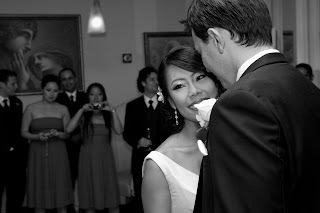 I gave up looking for a MA because I couldn't find anyone that could do makeup on my lil' asian face:( (I ended up doing it myself, looked ok) Anyways, the bride looks absolutely gorgeous! !